Smile Inn - Hotel in Bangkok, Thailand - Situated at cultural Damrongrak Road in inner Bangkok and Surrounded by Most Popular Tourist Attractions. Sawasdee Smile Inn - One of the best budget & most comfortable hotels in Bangkok, Thailand. Sawasdee Smile Inn is situated in inner bangkok and surrounded by most popular tourist attractions. Sawasdee Smile Inn - One of the best budget & most comfortable hotels in Bangkok, Thailand. 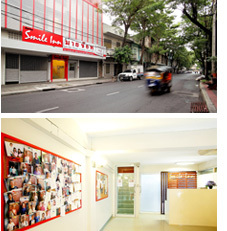 Smile Inn is situated in inner bangkok and surrounded by most popular tourist attractions. Sawasdee Smile Inn - One of the best budget & most comfortable hotels in Bangkok, Thailand. Sawasdee Smile Inn is situated in inner bangkok and surrounded by most popular tourist attractions. SMILE INN, a small and cosy accommodation, is situated in cultural Damrongrak Road in inner Bangkok, Pom Prap Sattru Phai, Nang Loeng. Perfectly located in the heartland of Bangkok. SMILE INN is surrounded by both business centre and cultural tourist attractions. Nearby business centres: Within 10-15 minutes walk on the same street of SMILE INN, you can find BoBae Tower, the biggest garment wholesale centre in Thailand. Besides, it is easy access to Klongthom (electrical equipment centre), Sampheng Street (shopping centre) and Yaowarat Road or China Town. Nearby tourist attractions: SMILE INN is located near various cultural and historical tourist attractions, especially well-known temples. Bangkok's temples are a unique part of the capital's heart and soul. A visit Bangkok would not be complete without seeing them. 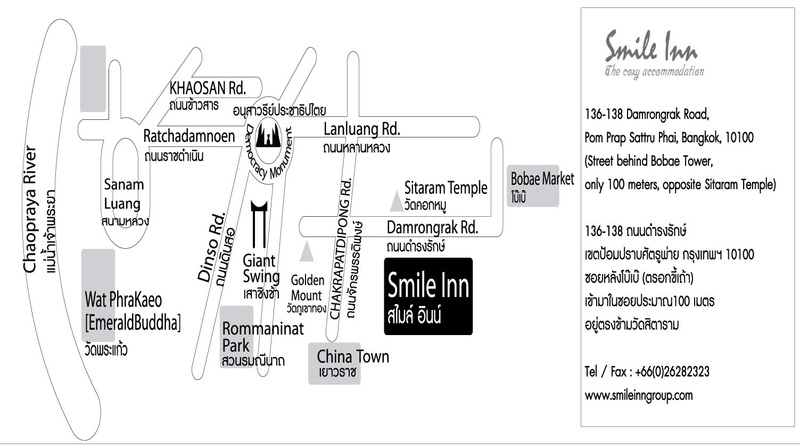 SMILE INN is directly opposite to Wat Sitaram. From SMILE INN, Wat Saket (The Temple of the Golden Mount) outstandingly stands in your sight. On a well-known historical road in Thailand, Ratchadamnoen, are Loha Prasat or Metal Castle and imposing Democracy monument. 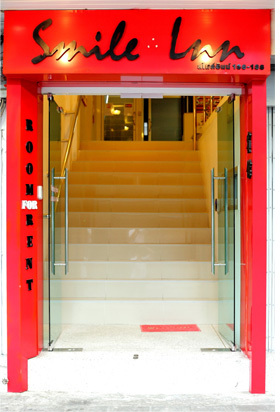 Moreover, a worldwide famous Khaosan Road is absolutely not far from SMILE INN. From there, you can also drop by Wat Pho, Wat Phra Kaew (The Temple of the Emerald Buddha), Grand Palace, Wat Benchamabophit Dusitwanaram (The Marble Temple) and Vimanmek Mansion. 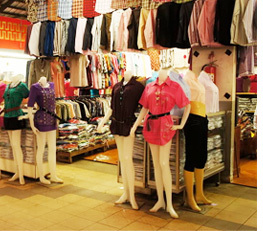 SMILE INN is an ideal place for starting your day since the dawn by visiting Bobae Market where a wide variety of inexpensive to quality wholesale clothes is available. Besides, there is another attractive dawn market, Sampheng. At Sampheng, you will find accessories and stationeries from a range of producers. 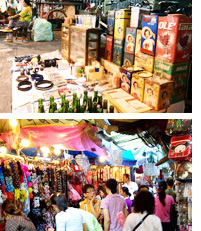 With a different atmosphere, you can shop at both markets from dawn till dusk. Moreover, Klongthom, one of the great electrical equipment centres in Bangkok, is not far from Sampheng. Reliable security system with electric entrance, 24-hour CCTV, and security guard. Copyright 2013 @ Smile Inn. All Rights Reserved.